Become the head of the biggest toy factory in the world as you race to save Christmas! Whether a patron wants a plushy pup or an adorable doll, you've got to move fast and keep ahead of the game. 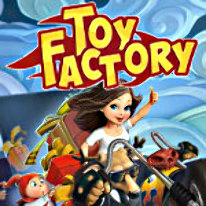 With dozens of thrilling levels, rockin' music, and eye-popping visuals, Toy Factory is the perfect pick-up-and-play game for any time of year!